The second day of the regatta has been marked by meteorology. The cloudy sky, the drizzles and the lack of wind early in the morning presaged a complicated day, but an unexpected turn of the wind has changed the scenario into a most interesting and competitive day. The route arranged by the organization team was developed near the coast of Barcelona, so that people could contemplate the stretches from the Port Olímpic, the Barceloneta or the Hotel W, so thousands of citizens and tourists from Barcelona have been able to enjoy, one more day, this unique spectacle. The alternation of results in today’s regatta has allowed a maximum equality in four of the five categories, which tomorrow, in the final day, will sail “with the knife between the teeth” to settle the final winner of the Puig Vela Clàssica Barcelona. The complicated weather from today has caused a delay of the exit, waiting for the wind to begin its direction. The cloudy sky and some drizzle presaged that the thermal south-west wind (Garbí) would not blow in today’s appointment. But at almost 2 o’clock, a south-east wind with 12 knots of intensity has started to blow, with some rages of 16 knots by the influence of some cloud. The chosen route has been a triangle between buoys, with different compositions according to the categories. The Classics have sailed 9.6 miles in five sections, while the Vintage and Big Boats have sailed 8 and 7.2 miles in three sections, in this order. The new wind conditions and the type of routes have caused changes in the results. In the Big Boats, it was Moonbeam III’s day, since it has been able to surpass the Moonbeam IV by 42 seconds. A narrow margin partly won thanks to the good work of the winner that avoided being misled by the Cambria at the end of the first leg. Adding the result of the two days, the Moonbeam III is placed leader tied to points with the previous leader, the Moonbeam IV. The Cambria seems subscribed to number three, as today it repeated the third position, which also maintains in the accumulated classification. The Cangreja Époque have also had a new winner. The Marigold, which was second yesterday, and today has beaten the Kelpie of Falmouth, and they are also tied to points after adding the two days, and the tiebreaker is favourable to the winner of the last disputed regatta. The Malabar X and the Marigan have also exchanged the yesterday’s positions, as well as those from the general classification. The English Argyll has been very attentive to the start of the regatta for the Marconi Époque, and has been able to keep at bay the Uruguayan Fjord III and the Argentine Cippino. Precisely in the reverse order of yesterday, provoking a triple tie in the accumulated classification, which now leads the English, followed by Uruguayans and Argentineans. 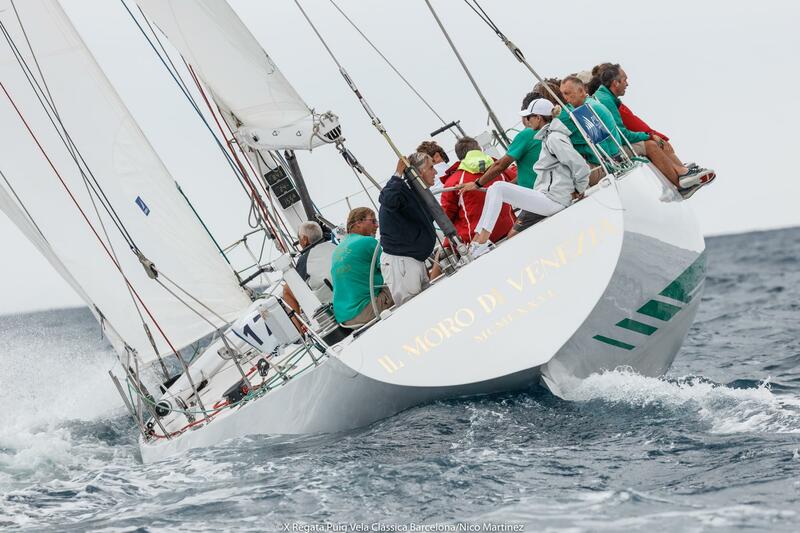 There has also been an abundant movement in the Classics 1, since the local boat Guia has achieved a relatively comfortable victory over the Samarkand (sixth yesterday), while Il Moro di Venezia finished third, and the French Sagittarius today went down to fourth place. So right now, the Guia controls the classification, tied to points with Il Moro di Venezia, while the Sagittaruis is lowered to the third place and the Samarkand rises to the fourth. It is worth mentioning that, today, the poor result of the Emeraude, yesterday fourth, has finished in the tenth position and is consequently discarded for the final victory. No change of leader in Classics 2, since Alba has enjoyed its victory again, ahead of Kanavel, Atrevido, Margarita Estalindalamar and Diana. In the general classification, the Alba is separated with 2 points against the 5 of the Kanavel, 6 of the Margarita and 7 of the Atrevido. 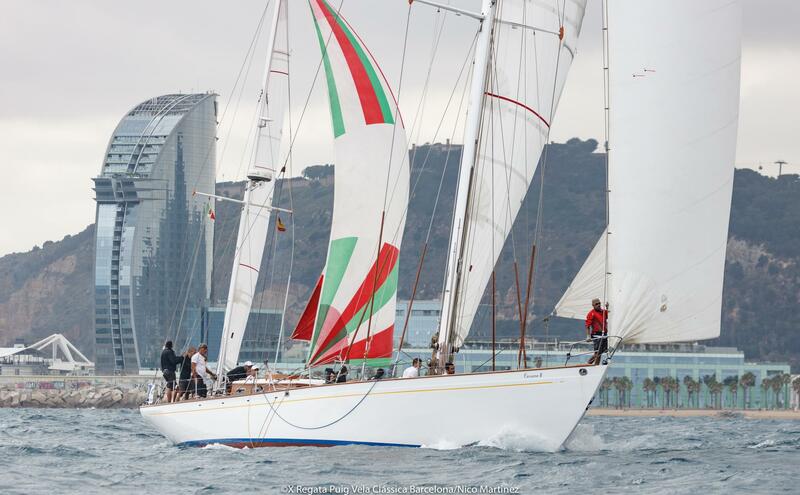 Among the sailboats debuting this year in the Puig Vela Clàssica Barcelona regatta, there are the Italians Il Moro di Venezia I and the ship of the Navy, the Corsario II. Il Moro di Venezia I was the first boat of the legendary saga “Il Moro di Venezia” by the Italian tycoon Raul Gardini, who put Italy at the top of the world sailing with a series of ultracompetitive sailboats, which were winners year after year of some of the most outstanding regattas of the international circuit, in addition to successfully participating in the Copa America, where they reached the final classification. In his debut in the Puig Vela Clàssica Barcelona, ​​Umberto Zocoa Rangome di Montelupo, sailor and mainsail of the boat, says that “I knew this regatta very well and I loved it after having sailed for many years aboard the Amorita and the Peter, and I kept insisting to my colleagues from Il Moro in Venezia that we had to compete here. This year I finally got it and I cannot be the happiest. Having this marvellous sailboat, winner of so many regattas, in the coast of Barcelona is a real honour”. He added that “in Il Moro di Venezia we are a great group of friends, we are very coordinated and very satisfied to be tied in the leadership of the Classics 1 category”. As for the two days of regatta, Umberto says that “for us, they have been very positive thanks to the magnificent wind we have enjoyed that besides, was fantastic for our sailboat”. Concerning to the Corsario II, it was designed and built for the Italian Naval Academy. This sailboat competes in the best regattas of the Mediterranean and serves in turn of training boat by the cadets of the Naval Academy of Livorno. Commissioned by the same Italian navy and captained by Simone Giusti, the Corsario II sails for the first time in waters of Barcelona. “Three years ago our teammates from Stella Polare and us were already really excited by the idea of sailing here,” says Giusti. 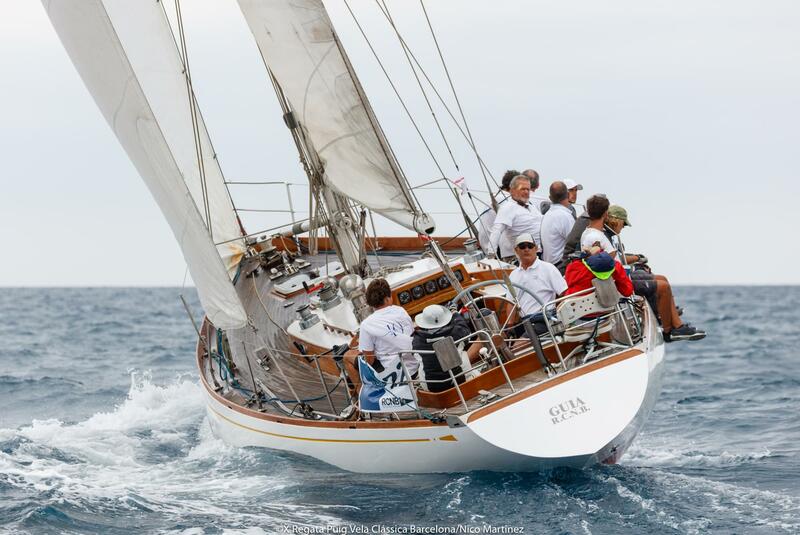 “The Puig Vela Clàssica Barcelona is proving to be a very nice regatta, with a lot of waves and wind, which makes the navigation very demanding. 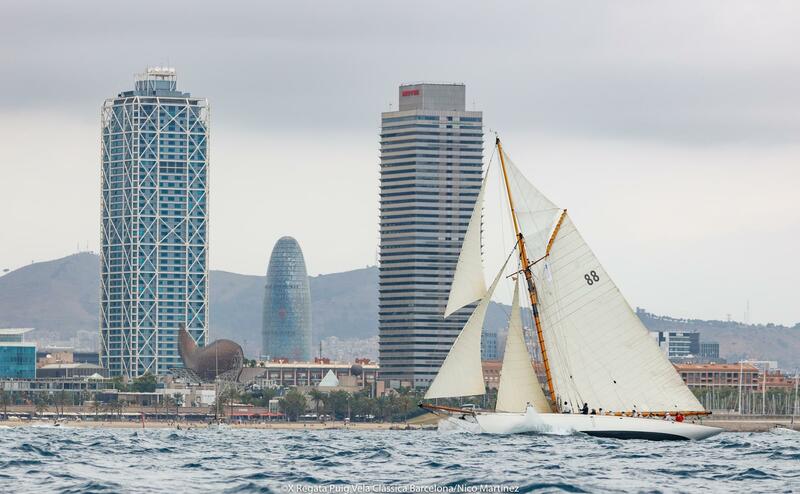 If we add it to the fact that this regatta takes place in a city like Barcelona, ​​this competition not any boat would resist the opportunity to repeat year after year”. With respect to his sailboat, Simone affirms that “since it is a school ship of the navy, the crew is in constant change. In this classic sailboat, where everything is manual, sailing requires a lot of strength, constancy and dedication, which is an extraordinary training for our marines”.